We hosted a NESCAC playoff game at Wesleyan for the first time since 2013 on Saturday, February 18, 2017. Despite falling 51-49 to Trinity, Silloway Gymnasium was packed to the brim. Long time, no post. My apologies. These past eight months have been an absolute whirlwind. To sum it up very quickly – year two at Wesleyan is complete. Which is nuts — almost 700 days after being hired by Cardinals head coach Joe Reilly, I’m having trouble believe it has been that long. Two years have flown by and this year feels like a blur, even over a month after taking some time to digest our 19-7 season that ended in an NCAA Tournament birth. For the second time in program history, and for the first time as an at-large candidate, the Wesleyan Cardinals reached the NCAA Tournament! We faced Liberty League champion Union in the first round (at Rochester) and though we ended up falling 89-83, it was a special opportunity that I hope is not once-in-a-lifetime. There are coaches that may go their entire careers without reaching an NCAA Tournament and I was lucky enough to be able to coach in one at the age of 26. It certainly shaped my outlook on future goals in the profession and should I be fortunate enough to be a head coach one day, it will be an experience I hope to share with my future players. As much fun as playing in the NCAA Tournament was, the entire season and process leading up to achieving that goal was honestly a blast. We began the season 11-0, the best start in almost 80 years of Wesleyan basketball and achieved a top-10 ranking for the first time in program history. That 11-0 start was punctuated by an amazing trip to Daytona Beach, FL where the team got incredibly close, we had a great victory over Washington & Lee (VA) and proved ourselves on a national stage with a convincing 81-65 victory over then number 4 Marietta (OH). The New Year started out rough with a trio of losses, but our squad proved very resilient as we bounced back with a weekend sweep of two-time defending NESCAC regular season champions Trinity and No. 5 Amherst. Those two games keyed an 8 – 2 run over our next 10 games including winning an over time thriller at Amherst, snapping their 32-game home win streak and securing an outright Little 3 Championship! It marked the second straight season we went 3-1 combined against rivals Amherst and Williams. We finished fourth in the NESCAC (6-4) and earned the right to host a conference quarterfinal playoff game. Silloway Gymnasium was packed to standing-room-only capacity and the fans were raucous and faithful. Though the game ended on a Trinity buzzer beater, it was as fun of an environment as you could imagine. Sadly, the end of the season meant the end of eligibility for two great seniors – guard Harry Rafferty (1,129 career points, 2nd team All-NESCAC) and forward Joseph Kuo (982 career points, 641 career rebounds). We will miss those two guys a lot – that’s pretty clear from their highlights – but I think the future we have built here is very strong as well. I am very proud of the work our rising seniors, juniors and sophomores have done to better themselves on and off the court and I am excited for our incoming recruiting class. In the Wesleyan Class of 2021, we are looking forward to having Austin Hutcherson, Antone Walker and Jordan James become Cardinals! In conclusion: many, many thanks to Coach Reilly, Coach Battaglia, the entire 2016-17 Wesleyan Cardinals squad and everyone who supported us. It was the best year-two I could imagine. 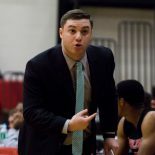 This entry was posted on April 27, 2017 by Coach Sass in College Basketball, Pratt/Wesleyan/Bard.